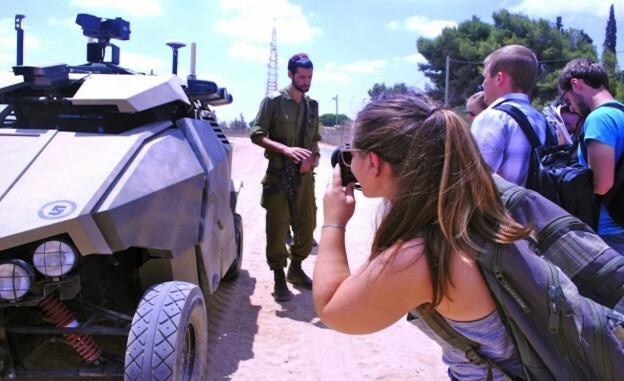 Students in the ieiMedia Jerusalem program visit an Israel Defense Forces military base. As a journalism professor at San Francisco State University in one of the most diverse cities in the world, I struggle to get my students to report outside their comfort zones. In my classes, I urge them to interview not just strangers, but people very much unlike themselves — older people, people with different politics, people of different races, religions, ethnicities and socio-economic groups. A few years ago, sick of seeing interviews with friends, classmates and roommates in my students’ assignments, I instituted the Two Degrees of Separation Rule — students had to be at least two degrees removed from any sources they quoted. They couldn’t interview their co-worker or their cousin but they could interview their co-worker’s cousin (as long as they hadn’t all gone out for drinks the night before). But even with that it’s been a challenge to get my students to venture out into the big, sometimes bad, world of strangers. "This summer I found the cure for what I had considered to be lazy reporting: I took a group of students to Jerusalem." This summer I found the cure for what I had considered to be lazy reporting: I took a group of students to Jerusalem. In Israel they had no co-workers and few cousins. They were in a foreign place with foreign people speaking foreign languages. To a great extent they didn’t understand the customs, the religious practices, the political system, the conflicts. They were at sea. And yet within days our 15 students (seven Americans, five Canadians, a Turk, an Australian and a Scottish-American who had grown up in Germany) were reporting and writing stories for our online website, JerusalemProject2013.com. I had taught in four study-abroad programs before — two in Italy and two in France — with the Institute for Education in International Media (ieiMedia), an independent journalism education organization that sponsors summer international media programs. In the European programs, students learned multimedia skills and mostly focused on light features — truffle hunting, winemaking, fresco restoration, snail farming. They interviewed strangers, worked with interpreters, navigated a foreign culture — but they were working in a pretty cushy space just outside their comfort zones. 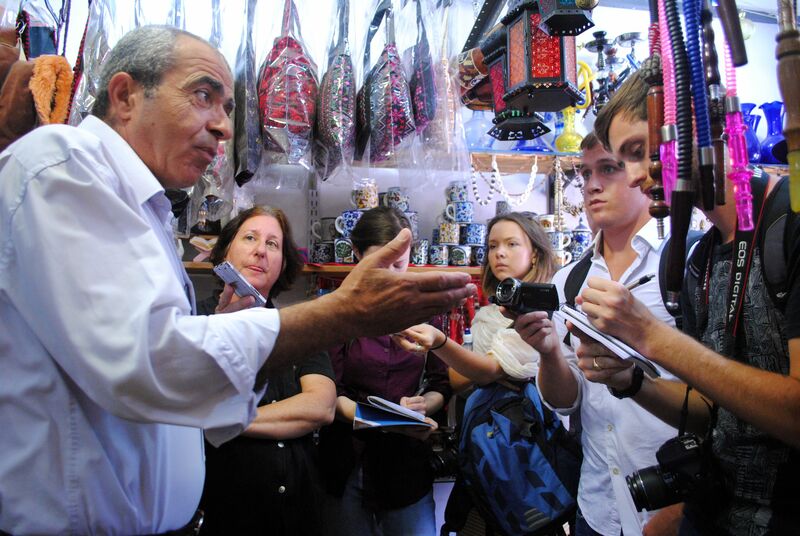 A Palestinian merchant in Hebron, left, explains the impact of the Israeli-Palestinian conflict on the local economy. My dream for the Jerusalem program, which was co-sponsored by the Rothberg International School at The Hebrew University of Jerusalem, was to take ieiMedia students to the next level, to introduce them to the real-world dilemmas and ordeals of hard-core international reporting, while keeping them out of danger. 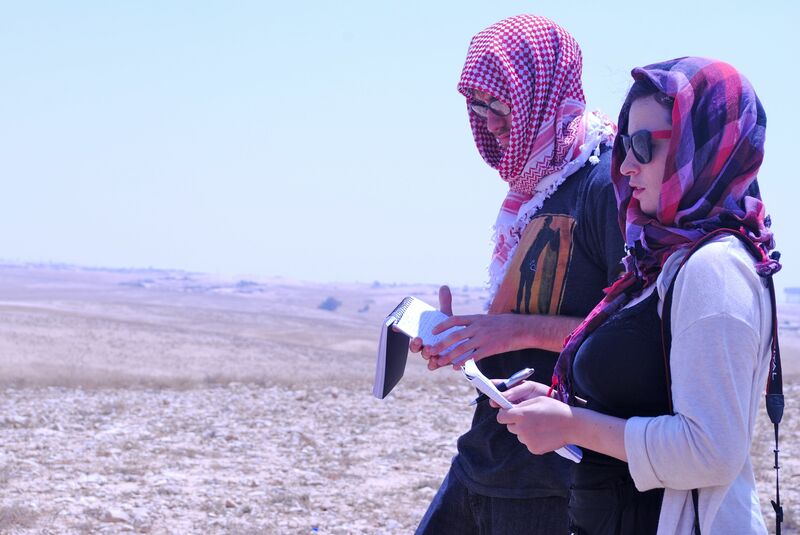 Our faculty of four — me, a Jewish history scholar, and two veteran Jerusalem-based foreign correspondents — did our best to prepare students for reporting on the complex issues of the Middle East. Eran Kaplan, the historian, taught them about the roots of the Israeli-Palestinian conflict — from the emergence of Zionism and the founding of the state to the 1948 Arab-Israeli War to the First and Second Intifadas. He made the history come alive with visits to Yad Vashem, the Holocaust museum; the highly disputed Temple Mount; and Ammunition Hill, the site of one of the fiercest battles of the 1967 Six-Day War. To better understand the political system we toured the Knesset and met with MK Yariv Levin, a Likud Party member and chairman of the coalition, as well as the spokesman for the Israeli parliament. 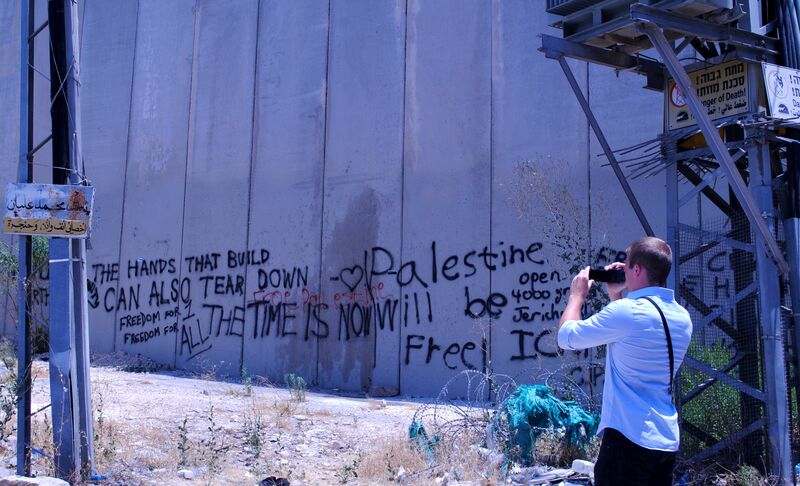 Christopher Essner, a 2013 graduate of Rutgers University, photographs the separation wall that divides Jerusalem. After a few days of orientation, we sent students out to report. At the time, U.S. Secretary of State John Kerry was shuttling back and forth between Palestinian and Israeli leaders, trying to bring them all to the negotiating table, so we instructed the students to go out and interview Jerusalemites about their hopes and thoughts about the prospects for peace. We wrote out descriptions of types of people — an ultra-Orthodox woman, a Palestinian shopkeeper, an Arab woman wearing a hijab, a Christian cleric — on slips of paper and had the students draw subjects. At first, the assignment seemed daunting. Would a student be able to snag an interview with an ultra-Orthodox Israeli Jew, someone who seemed so closed to the world outside his tight-knit religious community? Would a veiled Arab woman be willing to share her views about Israel with a stranger? And yet all the students managed to come back with the assignment. The young journalists were excited to talk about their reportorial victories. One pair of students, a man and a woman, managed to get a young Haredi couple, with their six young children in tow, to talk openly about their religious beliefs and their ambivalent feelings about Arabs. The only problem was the ultra-Orthodox couple wouldn’t agree to having their photo taken on Shabbat. Our intrepid students went back to the Old City twice to get shots of the family. A Jewish student, who had admitted feeling uncomfortable in the Arab Quarter of the Old City on our first day of orientation (she breathed a sigh of relief when we broke for lunch in the more familiar Jewish Quarter), got past her discomfort and interviewed a young Palestinian woman who supports Hamas and likened the Israel Defense Forces to a terrorist group. 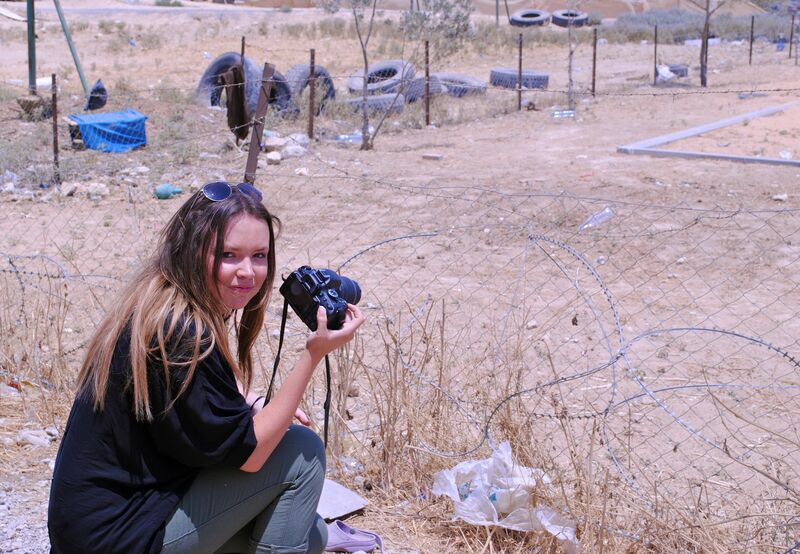 Bianca Britton of the Queensland University of Technology in Australia explored Palestinian refugee camps in the West Bank for her final project. Within days, our students were feeling almost comfortable outside their comfort zones. They were venturing out, not just into the neighborhoods of Jerusalem but into the West Bank. Though as a faculty we had decided not to take students into the occupied territories (except for one day in Hebron and a brief stop in touristy Bethlehem) for fear of problems with insurance and university regulations, we didn’t forbid students to travel there themselves. And many did. They found their way to Nablus and Ramallah, to Palestinian refugee camps and protests against the occupation in small Arab villages. They figured out bus schedules in foreign languages, lined up their own translators and passed through security checkpoints — sometimes getting briefly detained and questioned by machine-gun-toting IDF soldiers. As a faculty we were amazed at their resourcefulness, their inquisitiveness, their verve. Will Lewis of Valdosta State University, left, and Maya Shwayder, a graduate of the Columbia Graduate School of Journalism, right, are among the 15 students who came to Jerusalem to learn about international reporting. Of course, these weren’t your run-of-the-mill journalism and communication students. They were a self-selected group who had sought out a rigorous program in a challenging environment. But I couldn’t help but wonder how other journalism students, those who were perhaps somewhat more timid and less inquisitive, would do in such an environment. Would they rise to the challenges? Would they become curious and resourceful in such a stimulating setting? Would they seek out discomfort and danger in pursuit of a story? Probably the most important lesson we as a faculty learned from the program was that when students are engaged and excited they don’t need much hand-holding. We packed our schedule with tours and meetings with people from different government and non-governmental organizations, bent on introducing students to a wide variety of perspectives on the Israeli-Palestinian conflict. We arranged meetings with a Jewish settler and a Palestinian merchant in Hebron, Bedouins living in the desert, and residents of the border town of Sderot, which has been under intermittent rocket attack from Gaza for 13 years. We met with patriotic IDF soldiers who were climbing the ranks and a former soldier who renounced his military service and laid bare for us the practice of “mapping,” in which soldiers visit random Palestinian homes in the middle of the night, interrogating and photographing every man, woman and child. We carefully presented the diversity and complexity of the Israeli-Palestinian experience so the students could produce balanced news reports. We wanted to make sure they would hear all sides of the story. But the students complained that we packed so much into the schedule we didn’t leave them enough time for independent reporting. We had planned for two three-day weekends, figuring they’d head off to Tel Aviv to decompress on the beach. But most of the students used their leisure time to report. After one free weekend, we heard that two students had found their way to Nabi Saleh, a Palestinian village known for weekly protests that sometimes turned violent. While our students were there, a spokeswoman for a human rights organization was shot in the leg, presumably by a soldier. One of the students who went to the protest came out of the experience with a great story and a series of graphic photographs. But as a faculty, we gulped hard when we heard how close the young reporter had come to danger and discussed if in the future we should forbid students from taking such risks. Even as we were forcing our students outside their comfort zones, they were forcing us outside ours. Correction: This article originally stated that the only program stop in the West Bank was Bethlehem. It has been updated to clarify that the group also visited the West Bank city of Hebron. The article was also corrected to clarify that the program was co-sponsored by the Rothberg International School at The Hebrew University of Jerusalem, as well as ieiMedia. Rachele Kanigel is an associate professor of journalism at San Francisco State University, where she advises Golden Gate Xpress, the student newspaper, and teaches reporting, writing and online journalism classes. She was a daily newspaper reporter for 15 years and has freelanced for magazines and websites, including U.S. News and World Report, TIME and Prevention. She directs summer study-abroad programs for ieiMedia for Education in International Media and is the author of The Student Newspaper Survival Guide. Follow her at @jourprof. What Rachele is doing here is laying the groundwork for a new generation of informed and committed journalists. Great work!